2016 UPDATE: Sadly the Flawless Face brand is no longer operative. 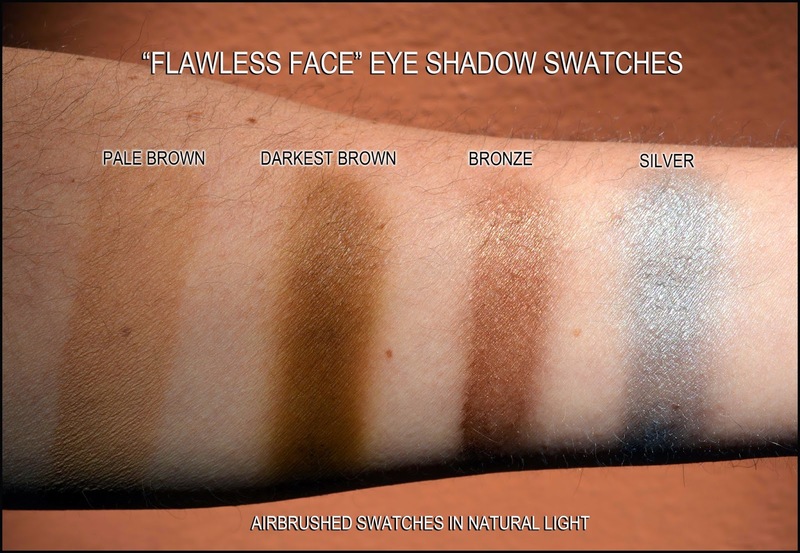 Based in Texas, Flawless Face is a new airbrush makeup brand offering an extensive line of water based foundation and eye shadow colours. The company's mission is to offer airbrush cosmetics that would allow users to achieve a "flawless and beautiful look without breaking the bank", and the website started out by offering its makeup in attractive 1.5 oz bottles at a fraction of the price charged by most other companies for smaller sizes. After the price, one of the things that made this brand very interesting to me was the color choice: 12 foundation colors, 29 matte and 22 shimmer colors that can be used as eye shadow but of course also as blush, highlighter and contour shades. 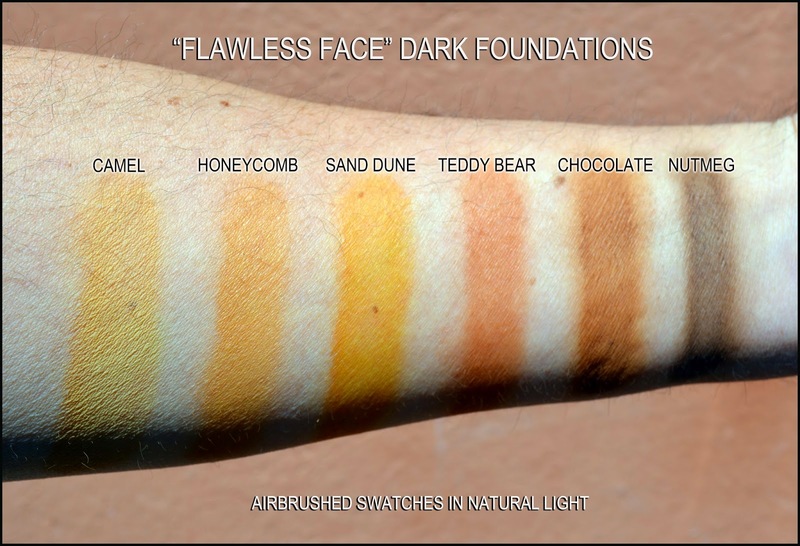 The foundation colors are also available in generous samples of .5 oz (15ml), or as a set of 12 colors for an even more convenient price. We were very happy to try these products, and you can see the result of our experiments in the video tutorial below, while we will continue here sharing our experience with the product. Foundations: the Flawless Face formula is one of the least viscous available. It is designed to work with any airbrush, and it definitely will because of its lightness. The drawback of using a thin liquid in an airbrush with a bigger nozzle (.35 and up) is of course that you have to be very gentle when spraying, or risk forming hot spots very quickly. On the other hand the product is less likely to clog your stylus, and even when that happens it is very easy to clean by simply backbubbling and flushing the airbrush. 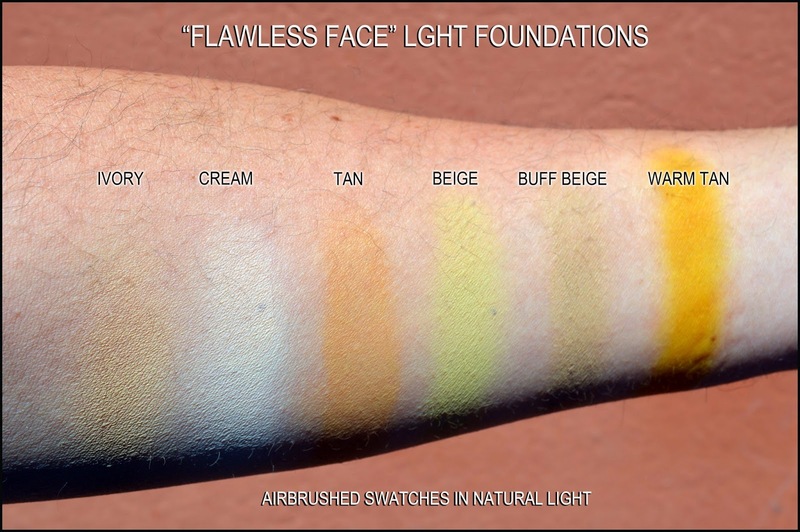 The foundation shades have a light fruity smell (they contain essence of Lilac) that will dissipate quickly leaving no after taste, and contain many natural ingredients such as Aloa and Ginko Biloba leaf among others. The formula wears comfortably on the skin, with a matte and slightly powdery finish. The shade range offers many possibilities and caters to all ethnicities. As you can see from the swatches at the bottom of this post, there are shades with strong yellow and red undertones, so a little mixing to balance the some shades will probably be required to achieve perfect matching. The most neutral shades are Ivory in the fair range, Buff Beige in the medium range and Chocolate in the dark range. The instructions on the colors suggest priming, concealing and powdering before applying the foundation. The priming and mosturizing step is of course fundamental, as with any airbrush brand, and Flawless Face just came up with their own water based primer. 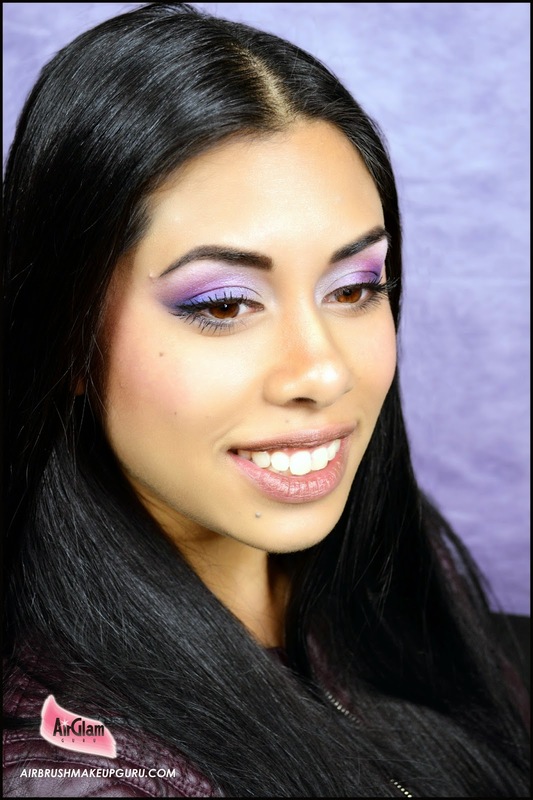 As for concealing and powdering before airbrushing, I am not sure that this is necessary, especially the powdering as the product is already matte enough, but it might be a good idea for less experienced airbrush users who may use the foundations to achieve a smooth finish easily and fast. Because of its light consistency, spot concealing will need a little practice: use the lowest pressure setting of your compressor and be extra careful to release as little color as possible, or the liquid will bead up very quickly and form hot spots. If this happens don't be discouraged, simply move on with the rest of the makeup and wait a little while before applying larger passes that will easily blend everything together. 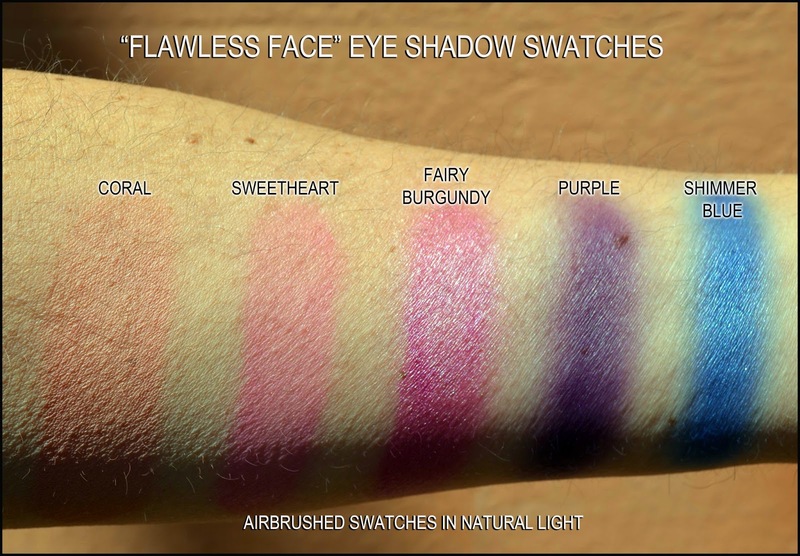 Eye Shadows: for me, this is where Flawless Face gets really interesting. The eyeshadow formula is also quite thin but pigmented enough and extremely easy to control and to blend, creating beautiful effects with very little effort. When applying the colors to the eyelid it is a good idea to alternate product and air, in order to help the color set faster. Again, care should be taken to layer the product lightly, or the whole makeup will risk cracking in the folds of the eye. If properly applied though, these eyeshadow will last all day without budging, and they have an uncommon resistance to water and rubbing, so much so that I was convinced they were formulated with silicone (they are not, as you can see in the ingredient list below). There are many colors to chose from, and these also come in the same generous 1.5 ounce bottles for the same very reasonable price. Basically, a 1.5 ounce bottles means only one thing as far as eye shadows go: it will last practically forever! In fact I hope that the company will make their eyeshadow range also available in the very handy .5 oz sample sizes, which would allow buyer to try out more shades and to build their collections more easily. We used our beloved Temptu system with heir SP .35 airbrush to spray the Flawless Face colors and achieve the look you see in the video. 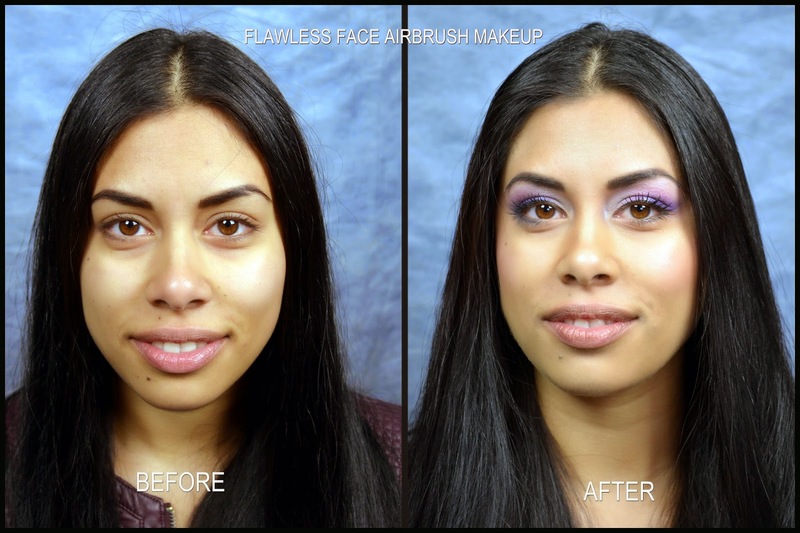 Recently Flawless Face started offering their own airbrush kit with three pre set speeds, so first time airbrushers can buy everyhting they need right on their website. The website ships worldwide and to the whole of Europe, and international shipping is a very reasonable flat rate of $20! *May Contain (+/-): Titanium Dioxide (CI 77891), Iron Oxides (CI 77491/CI 77492/CI 77499), Chromium Oxide Greens (CI 77288), Ultramarines (CI 77007), Mica (CI 77091).